Ever since Twitter acquired Tweetdeck, ther has been much speculation over the future development. Especially since Tweetdeck for Android had one of it’s most popular features, the Deck.ly service removed and the app hasn’t been updated for over a year. But thankfully the Tweetdeck team haven’t abandoned its Windows application. And in fact they have added quite a few features to enhance the user experience. 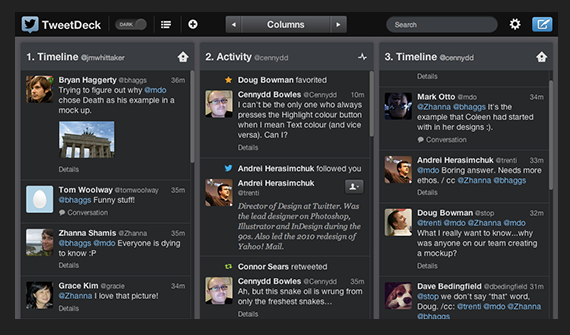 Let’s take a look at what the latest tweetdeck update brings to us. Press ‘N” to compose a new tweet. Press “Esc” to close the window. The developers have mentioned that more shortcuts will be added in the future. Tweetdeck have added support for Photos and Cards for many websites, which means you’ll be able to view them with the app on your timeline. You can now search for lists by other users by searching for @username/listname in the search box, and add the list as a new column. Search columns can be edited and the results will be displayed in the same column instead of adding a new one. One feature that has been missing from Tweetdeck is the “clear saved search” function, if you misspell a search term or don’t get any search results, you can’t remove them from the search colunm. Hope they fix it in future versions. You can download Tweetdeck here.